It’s almost been a year since I last updated this website and it feels good to be back. I had a lot going, like starting my freelance career and getting ready for another announcement coming near the end of this post. 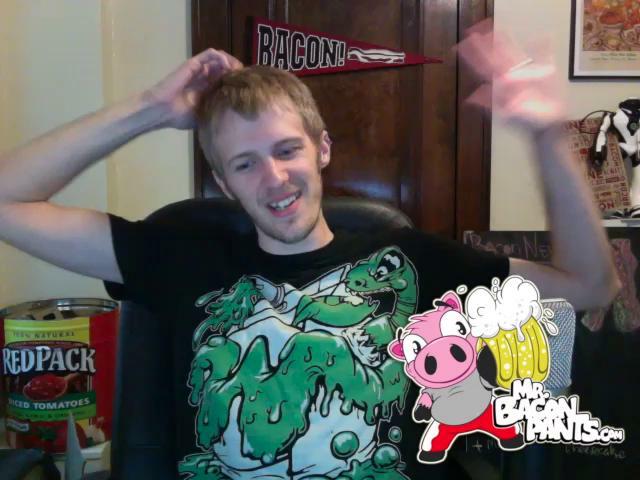 Even with lack of blog updates Sean and I have been still doing Bacon LIVE weekly for our fans. You can find all the shows on uStream.tv. But dont worry about bookmarking that link, because we are now using Google Hangouts to record the show. So make sure you subscribe to my Youtube Channel to get the new shows. 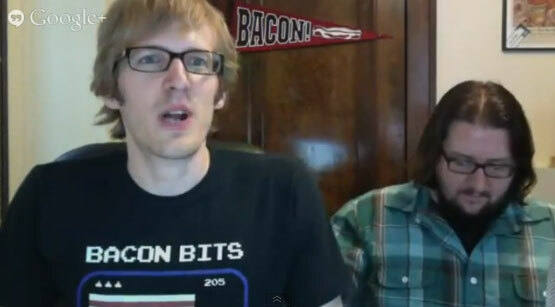 How we record Bacon LIVE is not the only thing has changed. I also made some small changes to the design of the site and removed some pages that where never getting updated. 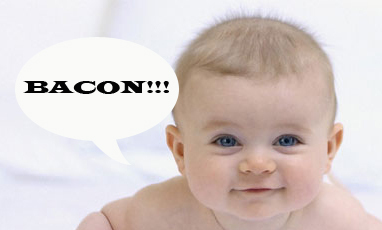 Sean and I have a lot of new content planned and are excited for the new Google Hangout Bacon LIVE. Lastly, the biggest change to the site will not be happening till the end of July. Beth and I will be bring a Mr. Baconpants Jr. in to the world. 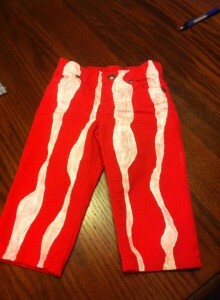 The photo attached to this post are little bacon pants made my Sean’s wife Molly. I will try not to turn this website in to a daddy blog, but please be ready for a few posts that may feature my new baby. Especially once he can fit in to those pants. One season 5 episode 19 (recorded on May 30, 2012) we talked about the rise in bacon crime, a fisherman that catches wild bacon, bacon taxes, the return of the KFC Double Down, the worlds biggest meat sandwich, yet another bacon burger, Bacon Salt competition, and a store about what Sean ate. 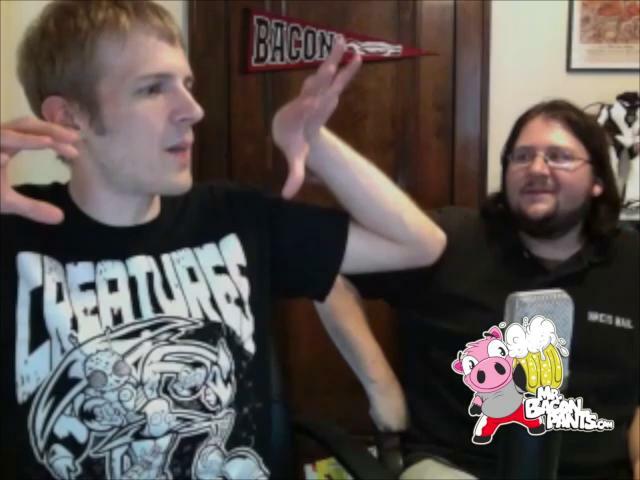 Go to BaconLIVE.com to learn how to subscribe and/or watch us live Wednesdays at 7pm ET! 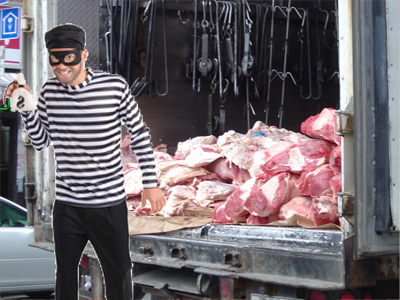 On season 5 episode 18 (recorded on May 16, 2012) we talked about a marathon runner that uses a bacon dangler, the boss bacon burger, inventor of chicken bacon, vegan zombie move, large pancakes, breaking for bacon, bacon wrapped contest, bacon cruses, and how to fry perfect bacon. Bacon LIVE: The Media Abuses the Power of Bacon! On season 5 episode 17 (recorded on May 9, 2012) I did the show solo since Sean couldn’t make it. 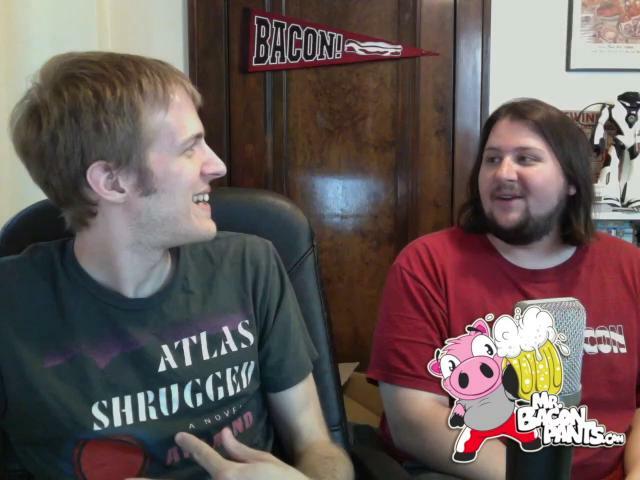 I talked about a bacon brawl, Michigan’s Bacon Fest, Lay’s BLT Chips, the media uses of bacon to get readers, fat people, bacon tax, and more.